For Windows Developers who need to control sound volume in vb.net, c++ , c#, vb6 , delphi, vfp, access. 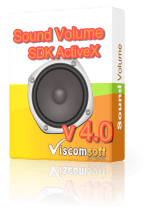 Step 1: Download trial version of Sound Volume ActiveX and installed it. MsgBox "set the master volume of first speaker " obj.W7GetSpeakersName(0) " to 0"
Step 3: double click test.vbs, It will set the first speaker volume to 0. Some system have two speakers, so you need select correct speaker , the following code select second speaker.